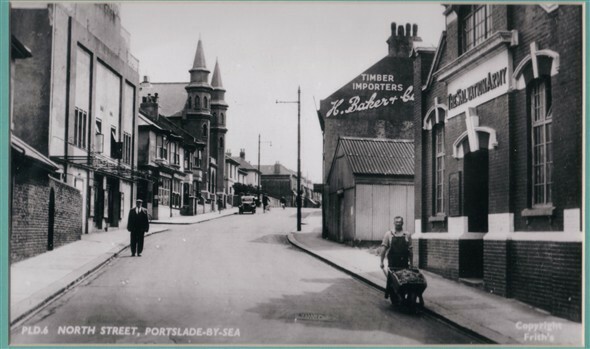 Does anyone remember a small cafe that was in Station Road, Portslade? It was quite near the corner of North Street. I think it was two or three shops down from the corner, going towards the sea. I worked there for a short while in one of the school holidays, in the early 1960s. It was run by a couple who had two boys, younger than me. It was an excellent cafe: there would be a choice of hot meals – casseroles, braised liver and lots of other lovely dishes. They were all freshly cooked in the oven every day. There was no stinting on the quality or the quantity. I remember that once I was told by the owner I had not put enough butter on a customer’s toast one day! Do you remember this cafe? If you do, please leave a comment below. The kitchen was kept spotlessly clean and the oven scrubbed out every afternoon after the lunch-rush was over. The place was always jammed full at lunchtimes. I was supposed to be the waitress but I was pretty hopeless and much too slow. Some people just asked for their “usual” and I was too shy to ask what that was. I gave in my notice because I just could not cope and felt totally inadequate – but the owners were really nice, hard-working people. Yes I remember it, it was called Dells or the Cabin. I spent a fair bit of time there in the sixties. Yes Eddie it was called Dells. I think the owners name was George, I have a few pictures taken outside the cafe with friends. Perhaps we knew each other as it was pretty small. I remember the juke box and the football table a crowd of us went there all the time. A few names I remember Bruce Townsend, Brenda Cooper, the Burtenshaws. Good days great memories. Sandy Taylor nee Goldsmith. Yes you are right Eddie, it was Dell’s cafe, I remember Sandy also, I do hope you are both well. Bruce. Gosh Bruce, how are you? I live in the West Country now but I have never forgotten those days of Dells cafe and the tin hut. Such innocent times, such wonderful memories. I hope that you and your family are well. With all best wishes, Sandy. Hi Sandy, great to hear you are well. Me and mine are all well. Yes, like you, as I get older my mind often drifts back to those old days and I wonder how many of us are still around. I have just heard that Angie and Little Bert have just passed on, So,so sad. All the best Sandy, God Bless. Bruce. Are you Bruce Townsend of “Bruce and the Spiders” fame? I am sorry Roger, I can not answer that as I don’t know you that well. If I knew why you were asking it may be different Sorry.